Do you ever dream of not having to deal with painful periods ever again? Or maybe you're conditioned to believe your period problems are just normal for you? Stabbing. Twisting. Pain. And the feeling of just wanting to...disappear. That's how I used to feel when I got my period. But I can also tell you from personal experience that it's actually possible to have painless periods. For so many years, I lived with menstrual agony and no understanding of how dietary and lifestyle choices influenced my menstrual health. Until I learned how to properly support my hormones, my period was a nightmare! Now, the agony I feel is when I hear about other women suffering with menstrual pain. And all too often, women accept this suffering as their fate in life. It DOES NOT have to be this way. I promise! 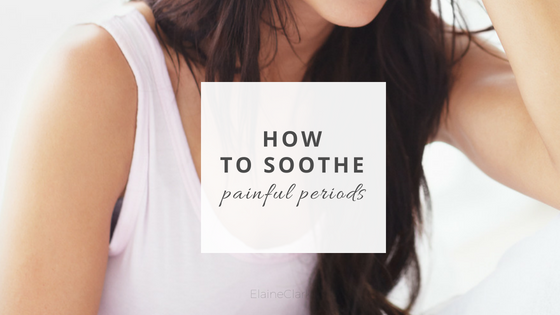 While every woman is cyclically unique and responds best to personalized period care, today I want to share with you my top 3 tips for soothing painful periods. Do you take pain killers before or during your period? A study done on the comparison of fish oil and ibuprofen for treatment of painful periods showed that supplementing with fish oil had a greater effect on reducing period pain than ibuprofen. This study concluded that fish oil is better than ibuprofen for treatment of period pain. Fish oil not only reduces painful periods but it also supports healthy hormone production and ovulation. As a bonus, fish oil also supports healthy skin and boosts cognitive function. Aromatic essential oils are often used in personal care products and are recognized as powerful aromatherapy to ease stress, discomfort, and anxiety. Massaging essential oils onto the pelvic area is a great way to relieve menstrual pain. According to a study in the Journal of Obstetrics and Gynaecology Research, a group of 48 women with menstrual pain and cramps massaged either essential oils or a synthetic fragrance on their lower abdomen. The women who used a mixture of diluted essential oils on the pelvic region for one full cycle reported less pain during their period. The right combination of essential oils is key for therapeutic benefit. LADYFLOW soothe is pelvic oil blend I've created specially formulated with essential oils to soothe period pain. For more information on how to apply click here. I like quick fixes and temporary relief as much as the next girl, but when it comes to lasting results, if you want to get to the bottom of your period pain you've got to revamp your diet! Research has shown that dietary choices can have a noticeable effect on your menstrual health. As a starter, swap out unhealthy fats for healthier unsaturated fats. Healthy fat is extremely important to support hormone production, lower inflammation, reduce pain during menstruation, regulate the menstrual cycle and help our body absorb important fat soluble vitamins. Aim to eat 25-35% of your total daily calories from healthy unsaturated fats found in fish, nuts, and oils. Be sure to choose snacks that have higher healthy fat content over high sugar content. Did you find this article useful? Do you suffer from painful periods? I would love to hear from you, lady. Let me know if the comments below. Older PostProfessional overdrive? You'll need this.